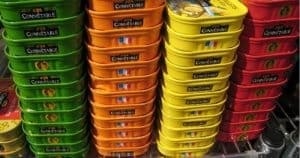 By now you hopefully know that you need an emergency food storage to be prepared for disasters like hurricanes, earthquakes, EMP, or even personal disasters like losing a job. 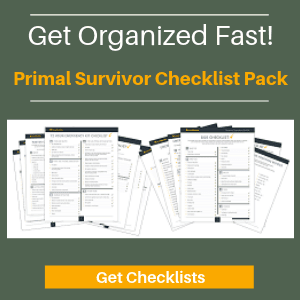 If you are an absolute beginner to prepping, then start with a 72 hour kit of emergency supplies. Once you’ve got that covered, move on to 30 day emergency food storage. 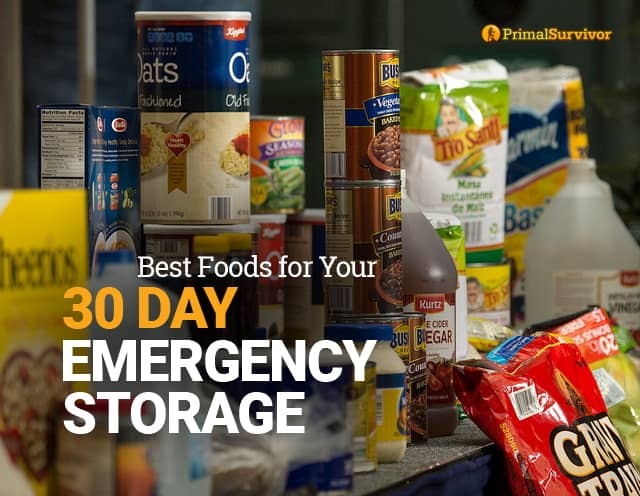 30 days of food is the absolute minimum you should stockpile for emergency preparedness (read why here). You’ll also need 30 days’ worth of water (read how to stockpile water here). Getting emergency food for 30 days may seem simple enough, but don’t just go out and buy a zillion cans of soup, boxes of crackers, and bulk grains. Disaster prepping should always be done with a plan! If you don’t plan what to get and how you will use it, you could end up with a lot of unusable food items in the aftermath of a disaster. To be fully prepared, you should have a combination of both types of emergency foods. You can find lots of ready-to-eat emergency foods in your local supermarket. The benefit of storing these foods is that they are easy. Picture your family sitting in your basement eating granola bars and soup straight out of the can as a hurricane rages around you. There is no need to cook, prepare, or even clean plates. You just pop open the packaging and start to eat. Another reason why you need to have ready-to-eat emergency foods is because it isn’t always safe to cook after a disaster. For example, you should never have an open flame after an earthquake. This is because gas lines break and an open flame could result in an explosion. So, if this is the case, you would want foods which don’t require cooking. 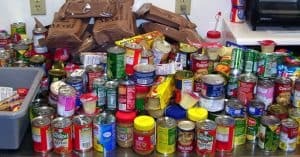 In theory, you could stockpile just ready-to-eat foods for your 30 day emergency food supply. However, it will probably get boring eating all of those canned and packaged foods after a few days (I’ve run disaster scenario drills before and can attest to how boring it gets to eat just packaged food!). Ready-to-eat emergency foods also tend to be lacking nutritiously. It might be okay to live off of granola bars for a day or two during a blackout, but all that sugar, fat, and sodium is going to make you feel like crap in a longer-term disaster situation. When you cook food, it is more nutritious and will give you the energy you need to stay healthy and alert in the disaster aftermath. Finally, you’ll want some emergency foods which require cooking because they taste better. Taste shouldn’t be a priority for disaster preparedness, but having tasty food can go a long way in alleviating the stress which comes with emergency situations. Even the act of cooking might be a welcome distraction from the disaster. Salt, herbs, spices, and seasoning packets: Eating just plain pasta, canned veggies, etc. can be really boring. A bit of seasoning can go a long way to making it taste better (and thus making the disaster aftermath less stressful). Powdered drink mixes: Preferably ones that have vitamins in them. A can opener: And make sure it is a manual can opener and not an electric one! Paper plates and plastic utensils: You don’t want to waste precious water on washing dishes, so have enough disposable plates and utensils stockpiled. 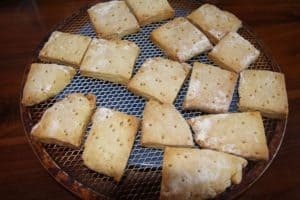 Off-grid cooking method plus fuel: If the utilities go down after the disaster, how will you prepare your food? Make sure you have an off-grid cooking method and enough fuel to last you through the month. You’ll notice that I didn’t include certain items like wheat grains or flour in the 30 day emergency food storage. It might seem logical to stockpile wheat grains for emergencies so you could make bread. But, let me ask you, do you know how to grind wheat into flour? And, if you do, how will you make bread if you don’t have any yeast? You’ll also need baking soda, baking powder, powdered eggs, and some other basics if you want to utilize your flour. As for stockpiling ready-milled flour, it can be a disaster if you don’t store it properly. You’ll likely end up with a moth or mold infestation if you don’t utilize vacuum-sealed mylar bags. Items like wheat and flour are fine to stockpile for your long-term supply. But, when you are just starting out, stick to the essentials. Once you’ve mastered the 30 day stockpile, then you can move on to the more advanced skill of long-term food storage. ***Note that it is really important that you store your emergency foods properly! We will be talking about this in the Primal Survior Members’ Area where we have a library or survival reports! 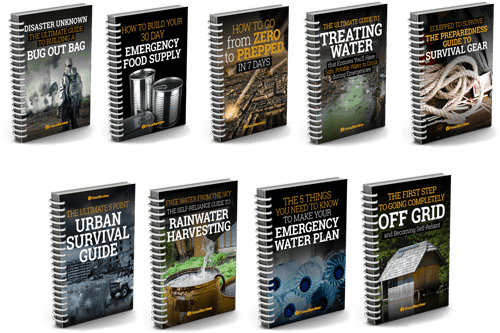 Have you built your 30 day emergency food storage yet? Let us know how it is going in the comments or join the discussion on our Facebook group! Live in Hawaii 6 mos per year. 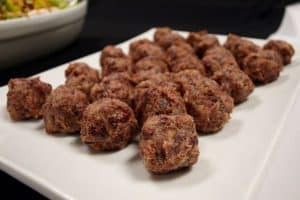 Any recommendations re: what company to purchase a 30 day supply from? Very humid and lots of pests so need a supply that is pretty air tight. There are a few good companies that sell freeze dried products , one is no better than the other. They are all expensive so just do the research and choose for yourself.